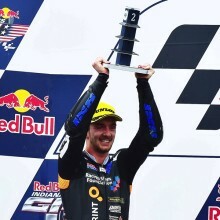 John McPhee stunned everyone when securing a podium in Indianapolis, which may have been through luck but was a strong achievement in tricky weather conditions. Are you happy with how this year has gone? “No I’m not really that happy with how its been going. But I am happy with my riding and the progress I’ve been making. I’ve been training harder than I ever have, I’ve been working harder with the bike and the team than I ever have, but we’ve not really got the results we’ve deserved. Obviously other than the podium at Indy which was a great feeling, and then last weekend in Brno we were really close to the front. Do you think Honda is the best Moto3 engine to have? What’s it like fighting through the big groups in Moto3? As a Moto3 rider what are your thoughts on Danny Kent’s potential move up to MotoGP?